I have used an iPhone for years, so I am used to the standard grid of apps on an iOS home screen. Android offers some unique capabilities, but still appears similar to iOS at face value. 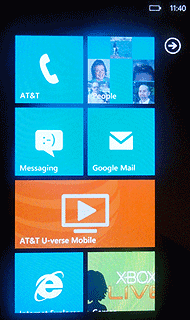 But, the tiles layout of Windows Phone 7 is a distinctive trademark of the mobile OS, and should make the 30 Days With Winows Phone 7 experience unique. If the Windows Phone 7 tiles were just a different shape than an iOS app icon, that wouldn't be very impressive or add any value. But, the tiles are more than that. Windows Phone 7 gives me the ability to pin virtually anything to my start screen as a tile--enabling me to configure my Windows Phone 7 device to cater specifically to me. The tiles interface is a unique, and distinctive aspect of the Windows Phone 7 OS. Windows Phone 7 lets me pin not only apps, but contacts, and even websites to the start screen. In a word, this is "awesome". Why? Because, it makes the smartphone both more customizable--enabling me to make the start screen into exactly what I need it to be, and more functional--giving me simple one-tap access to the apps, contacts, and sites I need most. On my iPhone, I have the Contacts app, and the Safari browser app both on my main home screen. But, finding a contact means tapping the Contacts app to open it, then surfing through the list of contacts to find the one I want before I can do anything. I can add contacts I use frequently to my Favorites list under the phone app--essentially putting them into my speed dial list--but it's not the same. Pinning a contact to the start screen doesn't just let me call them faster, it lets me communicate with that contact more easily. Period. I pinned my wife to the start screen, and when I tap on the tile it opens up to her contact info which gives me the option to call her mobile phone, or call her at home, as well as text message, or send an email to any of the various email addresses I have listed for her. It also shows me her most recent Facebook status update, and I can swipe to the right to get a broader view of things she has posted on various social networks and online services. Being able to pin websites is equally empowering. Rather than having to open the browser app, then surf through my favorites and bookmarks to find the site I want, I can just pin the sites I use most frequently as a tile on the start screen and get there in one tap. Another nice thing about the tiles is that they aren't just static squares--they are live tiles that display dynamic content. My email tile displays the number of new emails I have, the messaging tile notifies me how many text messages I have, and the Windows Phone 7 market tile lets me know how many updates are available for apps I am using. For contacts, the tile rotates through a mini slideshow of sorts. It displays the picture associated with that contact (by default it is the Facebook profile photo), then the contact's name, followed by the text of the most recent status update. For websites, it shows a thumbnail of the site's current content. There are a variety of apps available that take advantage of the dynamic content aspect of the live tiles. For example, apps that display the time or current weather can automatically stay up to date. The reason all of this matters is that it sets Windows Phone 7 apart in terms of functionality--at least from iOS. I can create a start screen that gives me quick, one-tap access to the contacts and sites I need to access the most, and that dynamically updates and displays relevant information so I can quickly see what I need to see without having to tap or do anything. Granted, Android is also very customizable, and even iOS can show me things like how many new emails I have, or how many apps I have that are in need of updating. So, Windows Phone 7 is not revolutionary per se. But, as a dedicated iPhone user I can say that there is a lot to like about the live tiles interface in Windows Phone 7, and that I find the Windows Phone 7 start screen more flexible and functional than my iPhone home screen.